In this issue 4 www.seniorshousingbusiness.com Seniors Housing Business n October-November 2017 As the 55-plus crowd mushrooms in size, so does demand for a new type of rental product. Also: OneStreet reorganizes company to capitalize on opportunities in active-adult rental market About the cover Azulon at Mesa Verde in Costa Mesa, Calif., offers 215 units of age-restricted apartments ranging from 682 to 1,206 square feet. KTGY designed the property. n Cover story Active adult communities evolve 24 Editor's Letter 6 Seniors housing is an emerging investment darling. Finance 8 CBRE secures refinancing for adaptive reuse project in Michigan. Stock Snapshot 8 Capital Corner 10 Lancaster Pollard ranks as top HUD lender again. Development 12 Ocean Land Investments to build 401-unit high-rise in South Florida. | Emerald Communities opens $145 million CCRC near Seattle. Acquisitions 16 Sabra buys skilled nursing portfolio for $430 million. | New Senior Investment Group to sell 15 LCS, Holiday com- munities for $295.5 million. Question of the Month 18 How do you know when it's time to start a redevelopment or repositioning project for a community? What's on Jamie Timoteo's mind? 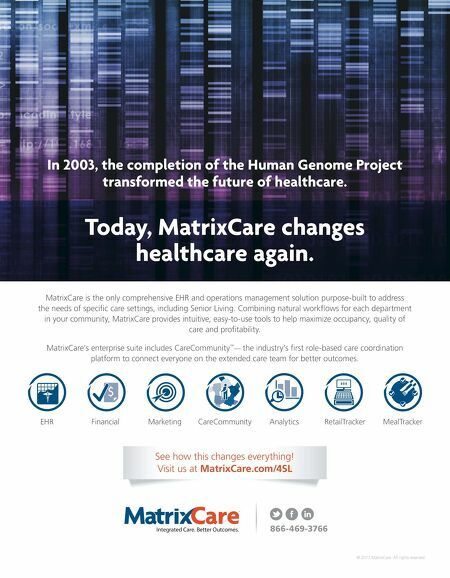 Market feasibility disruptions show that the way we look at development desperately needs recalibration 46 n Company Profile Caddis Healthcare Real Estate 36 Developer uses deep analytics and strong marketing to bring a new type of product to market. North Shore Place in suburban Chicago recently sold for $700,000 per unit. The new owner, Blue Moon Capital Partners, plans to add 32 units to the assisted living building. For years we've helped investors, lenders, operators and developers make informed investment decisions in the healthcare and seniors housing industries. How can we help you? Valuation | Consulting | Litigation | Feasibility | Tax | Transaction Support BIRMINGHAM | BOSTON | DENVER | LOS ANGELES | SARASOTA healthtrust.com | 941.363.7500 WE KNOW YOUR MARKET Do You? H E A L T H T R U S T n Investment Should I buy, sell or hold? 28 Large funds take center stage in pursuit of high-yielding assets. Also: A good time to buy skilled nursing assets? Yes and no n Operations The home care, home health challenge 32 Senior living providers tackle a low-margin business with a variety of approaches. 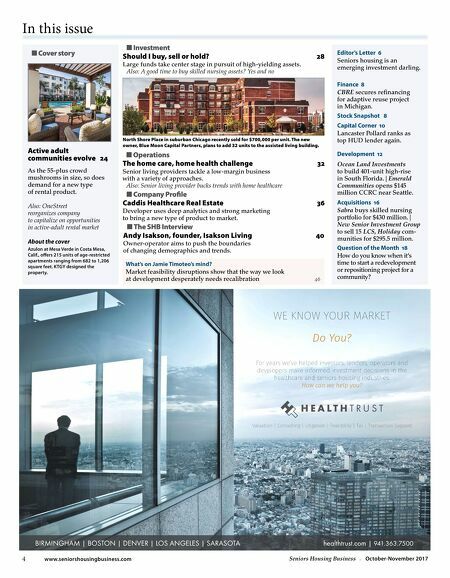 Also: Senior living provider bucks trends with home healthcare n The SHB Interview Andy Isakson, founder, Isakson Living 40 Owner-operator aims to push the boundaries of changing demographics and trends.